Pietro is left experiencing a gaping loss when his partner Sara leaves him after they repeatedly try and fail to conceive. Soon afterwards she reveals to him that she is pregnant from a one-off encounter. As Pietro attempts to accept this grief, he begins a friendship with an aging war veteran, Olmo, becoming fascinated by the story of this man’s experience of war in Russia. Alongside Pietro’s own story, is that of his grandfather Mario, who was locked away after returning from war in Russia, driven mad by what he experienced there. Sections in which he recalls the little he knew of his grandfather are riveting, and create an image of this disturbed man as seen through the eyes of a child. In search of understanding and at Olmo’s behest, Pietro eventually travels to Russia, a journey which is sensuously presented and rich is detail. 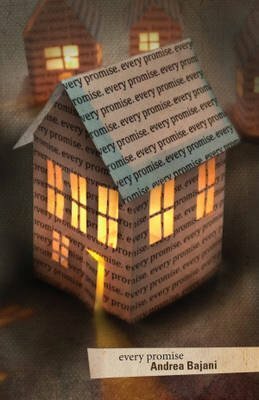 Every Promise is a difficult novel due to its complex, nuanced plot. It is an overwhelmingly elegiac story which laments lost love and happiness; yet it is also an incredibly beautiful book, which reminds readers how passionately a new author can make one feel. Bajani’s prose is elegantly constructed with mesmerising, poetic metaphors, which will endear lovers of literary fiction.